Hi everyone, (belated) happy new year! Much like the German Bundesliga and the Spanish Liga, I’m back from my winter break this week, refreshed and raring to kick off 2014 with a bang. And to stretch that tenuous football analogy a little further, I’ve got a veritable Bayern Munich of a show in store for you this Tuesday! Following on from my last show of 2013, where I focused on the Best Beats of dance music, I’m going to present yet another show chock full of my favourite beats and percussion. You see, I barely scratched the surface of great beats last time so I’ve got loads more to spin for you. Expect two hours of classic tunes, old and new, from the realms of funk, hip hop, electro, big beat, breaks and beyond… all featuring some of the best drums and beats in dance music. 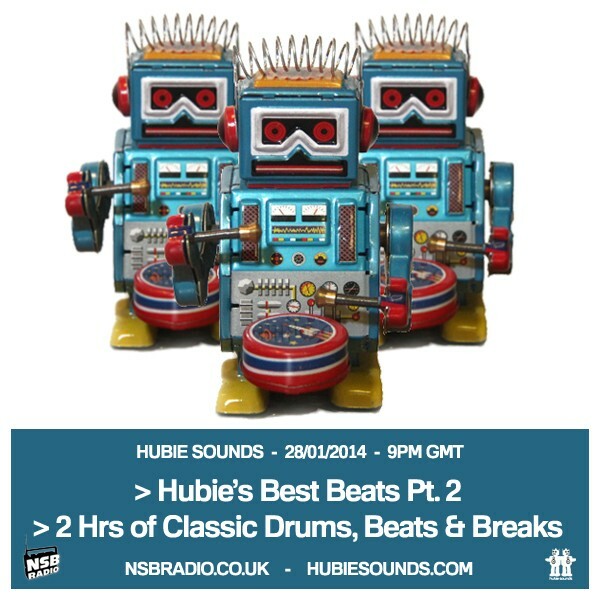 Hubie Sounds 076 – Hubie’s Best Beats Pt. 2 – Tuesday 28th January @ 9pm GMT – live and direct on NSB Radio!